Posted 12/19/2011 11:26pm by Miranda Combs. Just a quick note to let everyone know that the market will be open this Saturday, December 24th. We will be open normal hours- 5 am until noon. All farmers and other vendors will be there. I will send out more detials later this week. Posted 12/15/2011 4:01pm by Miranda Combs. We will be open this Saturday, and will have a full contingent of farmers and vendors available. I spoke to a few of the farmers so read below for an update. But one thing I would like to mention is to think about the Farmers Market as a source of holiday gifts and house warming presents. Some of the ideas I have are.... A smoked pheasant (they come vacuum wrapped) from the JL Kennedy Meat Stand, A fresh potted flower from Zang's Greenhouse, a pound of coffee beans from the Kew Park Coffee Bar, a bottle of olive oil from the California Olive Oil Connection, a piece of local cheese from PA Made Cheese, home made baked goods from Rebecca Plum, a jar of local honey from flower and bee, a fruit basket from Kistaco Farm, a jar of all-purpose sauce from Mrs. Jones, hummus from the Greek Gourmet, a jar of amish made pickles from Greenawalt Farm. You can use your immagination and put together a nice basket of items from the market. I think people really appreciate getting locally made and grown items. Kistaco will have 12 varieties of apples this week. They will also fresh cider. Kistaco will also have ready made holiday fruit baskets. They will have them this week and next week. If you want to be sure to get a specially made backet, you can order them this Saturday for next Saturday. Rick from Zang's Greenhouse will still have some local vegetables, including potatoes, mushrooms, leeks, onions, celery root and shallots. Chestnuts are imported from Italy. In the flower department, Rick will have poinsettias, cyclamen, and Amaryllis. Rick also has some really nice locally made wreaths. Locally grown items include potatoes and squash. Of course eggs are always available. Brian picked up quite a bit of pine greens for decorating the house for the holidays- varieties include Blue Spruce and White Pine. Greenawalts also have lots of prepared items like jellies, pickles, mustard and beets. All are locally made, and some are Amish made. They carry locally made frozen pasta and dried egg noodles. Peter Williams from Kew Park Estate Coffee in Jamaica visited the market last Saturday. Peter had a great time visiting the market and talking to customers. We spent the afternoon visiting coffee roasters. We met with Sam Patti from La Prima, TJ Fairchild from Commonplace, and David DiOrio from 19 Coffee. It was really an excellent day and we learned a lot from our meetings. We asked each of these roasters to do a test roast for us. So we will be offering coffee roasted by each of them over the next few weeks. We encourage input from our customers so that we can make a final decision on who to partner with to roast our coffee. This Saturday we will be brewing the beans that were roasted by La Prima. Tana set up shop at the market last Saturday, and we expect them to be back this Saturday. Tana is a neighborhood restaurant located in East Liberty at 5929 Baum Blvd., a few doors down from the Carnegie Library. Restaurant Owner Seifu Haileyesus will be there. They will be serving food from 9 to 11. If you have not tried TANA yet, you need to get over there for a visit. Our family goes there regularly. The food is very well prepared and flavorful. We continue to sell cookbooks that were written by my father- Joe Lagnese. The book is called "Cookin"- and is a book on food and life. My father, was a big part of my inspiration and passion for food. So I am really glad that he spent the time to put together his thoughts on life and food into a book. The Post-Gazette ran a nice little article on the book. Check it out. Proceeds from sales of the book goes to a foundation that our family established to benefit people afflicted by Cystic Fibrosis. We lost our sister-in-law, Muriel to CF last year, so we call the fondation Muriel's Breath of Life... We will be selling books at the market. They are only $10, and we will donate an additional $15 to the foundation for each book sold. They also make great holiday gifts. Posted 12/14/2011 6:03pm by Miranda Combs. ***SPECIAL holiday refreshments for our customers at the annual open house starting at 6 am and while supplies last! ENJOY! As always, we will have a nice variety of our regular selections available. Posted 12/8/2011 9:49pm by Miranda Combs. We will be open this Saturday, and will have a full contingent of farmers and vendors available. We will also have a few special events this Saturday, please see below for details. Both of these items are unique, so please get to the market to try them out. I would expect from the other farmers- Kistaco, Greenawalt and Zang's to have similar items as last week. They will offer a combination of locally grown items other select fruits, vegatables, and flowers. Peter Williams from Kew Park Estate Coffee will be visiting the market this Saturday. It has been over a year since Peter has visited, so we are really excited to have him. Jamaica is a long way off, so we really appreciate when Peter visits. Peter will be at the market from 7 AM until about 10 AM. It is a great opportunity to meet the person that grows the coffee we serve at the market. After market, Peter and I plan to meet with a few local coffee roasters so that we can begin roasting the raw (green) beans locally here in Pittsburgh. We are very excited to reach this milestone. I will have more details in next weeks update. Tana is a neighborhood restaurant located in East Liberty at 5929 Baum Blvd., a few doors down from the Carnegie Library. We invited Tana to come for a few weeks to set up a both to share their delicious Ethiopian cuisine with us. Restaurant Owner Seifu Haileyesus will be there. They will be serving food from 9 to 11. Posted 12/7/2011 11:26am by Miranda Combs. Posted 12/1/2011 10:14pm by Miranda Combs. We had a great thanksgiving season at the market. Thanks to everyone who supported the market during the holiday and throughout the year. One of our challenges as a market is that many people think we close for the winter after the thanksgiving holiday. Of course we do not, we are open all year long, every Saturday. So we are asking all of our loyal customers to take one or two of our promotional post cards for the market and give it to friend or family member to let people know that we are open all winter. We will be passing out the cards this Saturday so thanks in advance for your support. One thing to note is that Peter Williams, farmer and proprieter of the Kew Park Coffee Estate in Westmoreland Jamaica will be visiting the market next Saturday, December 10th. More details in next weeks update. Kistaco will have 12 varieties of apples this week. They will also have cider, fresh cooking greens and squash. I know I was too busy to make a pie over the holidays, so I cheated and bought one from the Kennedy's (which by the way was fabulous). But I picked up one of those fancy earthenware pie dishes from Williams Somona today and plan to make an apple pie this weekend. Rick from Zang's Greenhouse will have a wide variety of local vegetables, including potatoes, mushrooms, leeks, onions and shallots. In the flower department, rick will have poinsettias, cyclamen, and Amaryllis. Locally grown items include turnips, potatoes, lots of squash. Of course eggs are always available. As mentioned, Peter Williams from Kew Park Coffee will be visiting the market next Saturday, December 10th. It has been over a year since Peter has visited, so we are really excited to have him. Jamaica is a long way off, so we really appreciate when Peter visits. After market, Peter and I plan to meet with a few local coffee roasters so that we can begin roasting the raw (green) beans locally here in Pittsburgh. We are very excited to reach this milestone. I will have more details in next weeks update. My father recently wrote and published a book called "Cookin"- a book on food and life. My father, was a big part of my inspiration and passion for food. So I really glad that he spent the time to put together his thought on life and food into a book. The Post-Gazette ran a nice little article on the book. Check it out. Proceeds from sales of the book goes to a foundation that our family established to benefit people afflicted by Cystic Fibrosis. We lost our sister-in-law, Muriel to CF last year, so we call the fondation Muriel's Breath of Life.. We will be selling books at the market. They are only $10, and we will donate an additional $15 to the foundation for each book sold. Posted 11/30/2011 2:51pm by Miranda Combs. ** PLEASE DON'T WAIT to place your holiday orders!!!! Remember we can only have your special items if you contact us via phone or at the market with enough time to prepare for you!!! Posted 11/20/2011 10:19pm by Miranda Combs. We had a great day at the market on Saturday- The market was packed from opening until closing, so it was a lot of fun. Thanks to everyone that supports the market and your local farmers. We are open the day before Thanksgiving- from 5 am until about 10 am. Many people have ordered their Holiday meats from J.L. Kennedy Meat Stand, so this is the big pick-up day. I asked Val Kennedy if there are still any holiday birds available for you procrastinaters out there. She said yes there are a few birds left, but its important to call out to the farm as soon as possible. Val also said there are PASTURE-RAISED CAPONS (special roasting chickens) available. The deadline for ordering is Tuesday at 5 pm, but obviously you should call as soon as possible. The number at the farm is 724-898-2316. The Kennedy's will also have their fabulous home baked pies- they will offer pumpkin, apple, Caramelapplewalnut, pecan, and strawberry/ rhubarb. Yum. No need to bake when these pies are available. Zang's and Greenawalts will be open with a wide selection of veggetables available. Kistaco Farm will not be open. As far as other vendors, the Kew Park Coffee Bar, California Olive Oil Connection and PA Made Cheese will all be open. 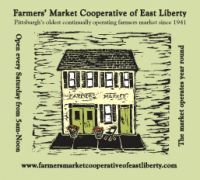 The market will be open as usual the Saturday after Thanksgiving. I think all farmers and vendors will be open with the exception of J.L. Kennedy Meat Stand. They will be taking a much deserved break. Posted 11/17/2011 9:01pm by Miranda Combs. We should have a great market this Saturday as people prepare for the big holiday. We will have a wide selection of foods available at the market. Hopefully you already have your order in with the Kennedy's for a holiday bird. Please stop by on Saturday with your shopping list in hand. Consider buying a gift item to take with you if you are visiting friends or family for the holiday. In addition, Pittsburgh's best cider from Kistaco Farm will also be available in 1/2 and full gallons. The Thanksgiving table would be incomplete without cider! Apple Butter made from Kistaco Farm apples will be available. Rick from Zang's Greenhouse will have a wide variety of local vegetables, including potatoes, beets, leeks, onions and shallots. Rick will also have local lettuce, mushrooms, cauliflower, brussels sprouts, cabbage and carrots. Imports include navel oranges from Florida, Cranberries from Wisconsin, and Chestnuts from Italy. In the flower department- cycleman flowers. Locally grown items include radishes, turnips, cauliflower, brocolli, buttercup lettuce, white potatoes, sweet potatoes and brussels sprouts. Lots of squash is available- varieties include- Blue Hubbard, Kabocha (Green and Orange), Delicata, Spaghetti, Butternut, Butter Cup and Acorn. Kohlarabi, and cabbage are available. In the fruit department, a few varieties of apples and pears. When I spoke with Brian this evening, he was still visiting farms and picking up items, and he was not sure if he will have locally grown strawberries. There are a few items to note this week. I received a new shipment of aged cheeses from Clover Creek Cheese Cellar. They include a wheel of their "Pirate Blue" Blue Cheses which I will have available this Saturday. We will also have the Blue Cheese from Common Folk Organics- amazing stuff from Lancaser County, PA, and fresh curds- from Arsenal Cheese in Lawrenceville. We still have some Membrillo (quince paste) and will give away 1oz pieces with a purchase of cheese. We will have hot coffee availale as always. In the juice department we will have fresh squeezed tangerine, orange and grapefruit juice. Packaged whole beans are available. As I mentioned last week, we received a new batch dried organic fruit from Van Dyke Farm in Gilroy, California. The fruit is certified organic. Its hand grown, picked and processed- then dried under the California sun. The flavor is incredible. Blenheim apricots are their signature item, but we also have nectatarines, pears and parsimons. Dried fruit and nuts always have a place on our Thanksgiving table. Check out the Van Dyke Farm website for more information. Please visit the market on Saturday! Posted 11/15/2011 5:47pm by Miranda Combs. Any special beef or pork item can be cut to order if called in by Thursday afternoon please. ** Per request we have offered local honey and bee pollen for the past few weeks and until it runs out!